The Praia da Falesia, a magnificent 8-kilometre-long beach, boasts of golden sands, transparent waters and a rolling sky marking the horizon, in uncanny resemblance of the generic escapist postcard. A relaxing getaway, this beach is fringed with spectacular orange-red cliffs (from which it gets its name, ‘falesia’ meaning cliffs) and comes with poignant sunset. Clean and impressively spacious, rest assured that the expensive sunbed you will be tempted to rent will enjoy its own luxurious space and won’t be packed in to the next one. We suggest that you park outside in the public parking lot at the entrance of the street that leads to the Praia da Falesia. From here, descend from the cliff and over the wooden bridge to reward yourself with the views this beach offers. Lifeguards are scattered along the length of the beach and it doesn’t generally get too crowded. For the adventurous, boat excursions and facilities for watersports are available from Vilamoura and Albufeira at either end of the beach that include scuba diving, windsurfing and water skiing. Vilamoura also has some of the best championship golf courses. There's plenty of little snack bars dotted along the length of the beach, where you can get some rest and enjoy a beer overlooking the North Atlantic Ocean. Carry sunblock and bottled water as there are bound to be a lot of long walks and frolicking in the sea. The washrooms at the snack bars are pretty clean. Wear comfortable footwear so you can explore the rock-pools and charming little coves along the beach. This is a great beach for running, sunbathing, swimming and spending some time with the family, but not too well-suited to snorkelling because of the fine, golden sand and lack of significant sea life. You can catch a bus to the beach by booking tickets at any local bus ticket shop at a flat fare of EUR 1.40, while a tourist day ticket is EUR 4. How popular is Praia Da Falesia? People normally club together Praia Do Oura and Olhos De Agua Beach while planning their visit to Praia Da Falesia. We came to Falesia in December to look for good weather and a quiet place to run, eat and sleep. Falesia and the surroundings offered just that a great weather and peaceful stay. The beach, cliffs, trails and the world class XC facility was not crowded. We had all we need for our stay, local small grocery stores, restaurants open in Falesia and surroundings. Highly recommended for nature, outdoor enthusiast and peaceful warriors. 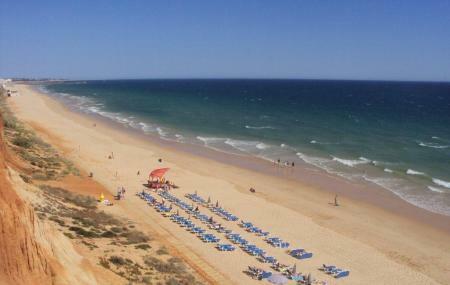 Best beach I've seen for a while 4k walk to Vilamoura never saw a crisp packet. Enough said. Very beautiful place. Big beach with very clean and beautiful see.